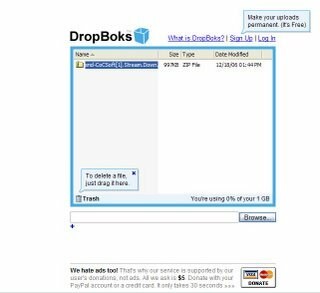 DropBoks is a little website that allows you to securely upload and download your files as you please. Even no register, just use an easy and quick way to store your files online. Each account has 1 GB of storage space available. You can upload and download files (any format) as large as 50 MB. It is really simple. If you are a registered user your file will keep longer as you wanted.